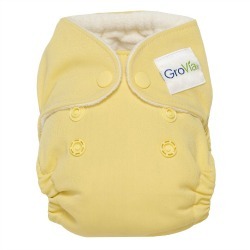 GroVia Newborn All In One Cloth Diapers - Trim & Soft! 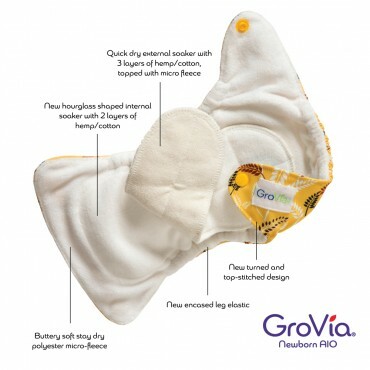 The GroVia Newborn All in one cloth diaper is designed specifically for newborns with a super absorbent, 55% Hemp - 45% Cotton soaker topped with soft poyester microfleece to wick moisture away from baby's tender skin. Outside is a soft water resistant TPU outer. New turned and top-stitched design. 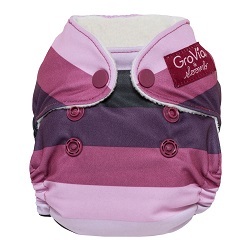 New hourglass shaped internal soaker with 2 layers of hemp/cotton. 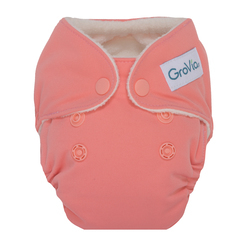 Fiber Content: 55% hemp/45% cotton inner, 100% polyester fleece lining against baby's skin, 100% waterproof polyester TPU outer. 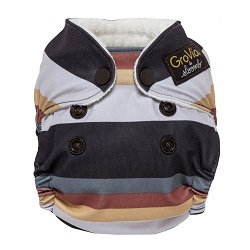 Preparation: Wash GroVia in hot with detergent and dry. Repeat process 5-6 times before first use. They will continue to gain absorbency the more they are washed. Care Instructions: Remove solid soil. 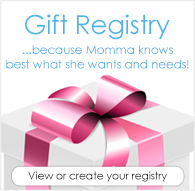 Store in a dry pail, no soaking or additives. Wash every 2 days on warm with detergent. Tumble dry on low. No bleach, enzymes or fabric softeners. No diaper creams. This diaper was so cute. Fit so well and trim. Did not experience leaks with this diaper. /'. 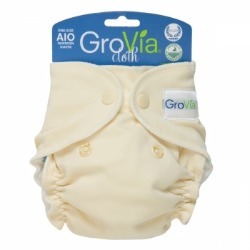 The fit on these is really nice, even on a big newborn, but the absorbency could definitely be better. I love the fit of these diapers. I've used them while babysitting and tried one on the sir when he was a nugget. My son outwet these diapers within an hour, but for the babies I've watched, they were good so long as I didn't put in on them before a prolonged nap. Good quality though. 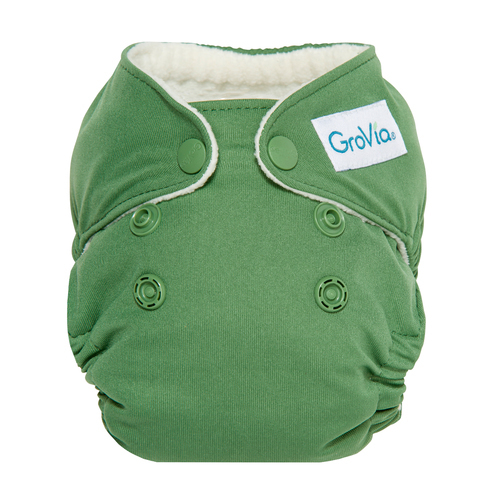 We had a few Grovia newborn for my son when he was born and I loved them sooo much. I had to order more when they were on sale. They are amazing! 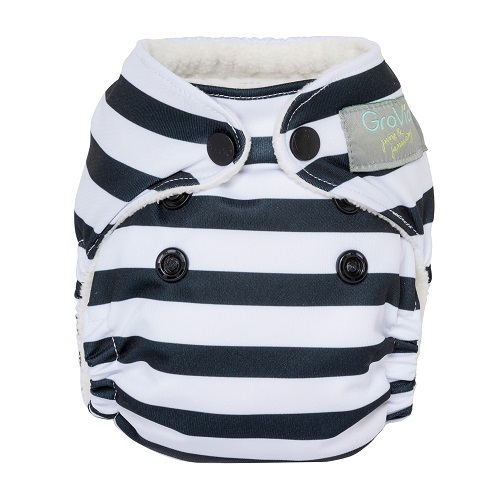 Love this diaper! 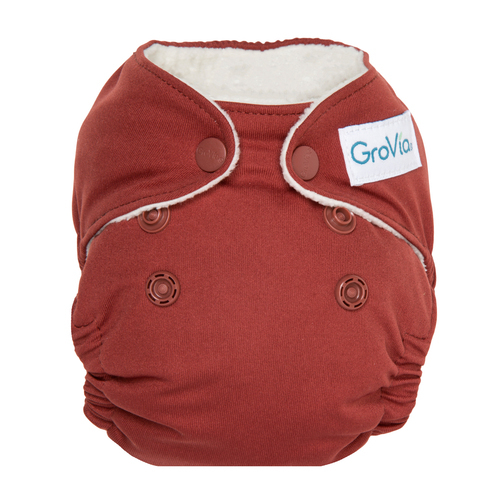 It has been a great diaper from birth for our baby at 7lb7oz and still working at twelve pounds. It fit under the cord and still has the absorbency we need. It is super cute and narrow between the legs.